U.S. Vice President Mike Pence, right, meets Myanmar leader Aung San Suu Kyi in Singapore, Wednesday, Nov. 14, 2018. Pence is Singapore to attend the 33rd ASEAN summit. Myanmar leader Aung San Suu Kyi rebuffed criticism from U.S. Vice President Mike Pence and other leaders Wednesday over her government's treatment of its ethnic Rohingya Muslims. 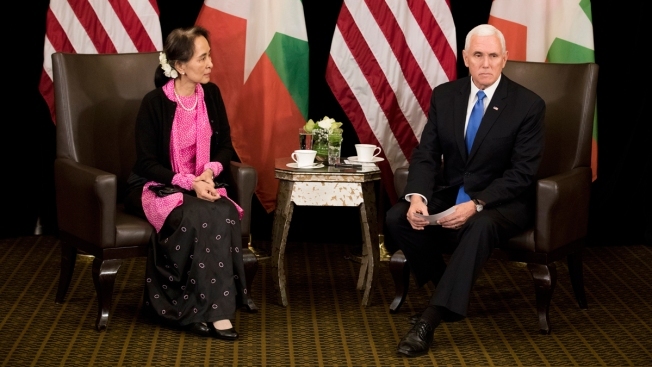 In a meeting on the sidelines of a regional summit in Singapore, Pence told Suu Kyi that he was anxious to hear about progress in resolving the crisis, which stems from a violent military crackdown in Myanmar's Rakhine state that the United Nations has called ethnic cleansing. "The violence and persecution by military and vigilantes that resulted in driving 700,000 Rohingya to Bangladesh is without excuse," Pence said. He added that he was eager to hear about how Myanmar will enable the Rohingya to voluntary return home. Pence also said Myanmar's arrest and conviction of two Reuters journalists was "deeply troubling" to millions of Americans. More than 600,000 Rohingya Muslims have fled Myanmar since late August from mass persecution by the country’s military, according to aide groups. U.S. officials are reportedly set to urge that Secretary of State Rex Tillerson formally declare ethnic cleansing is going on as lawmakers seek new sanctions against Myanmar. "I look forward to speaking with you about the premium that we place on a free and independent press," said Pence, who is representing an administration with an unusually adversarial relationship with the news media. Pence and Suu Kyi met during the annual summit of the Association of Southeast Asian Nations in Singapore. Pence is attending that and the summit of the Asia-Pacific Economic Cooperation forum in Papua New Guinea later this week in President Donald Trump's stead. A day earlier Malaysian Prime Minister Mahathir Mohamed made an unusually harsh public criticism of Suu Kyi, saying that as a former political prisoner she should better understand suffering. 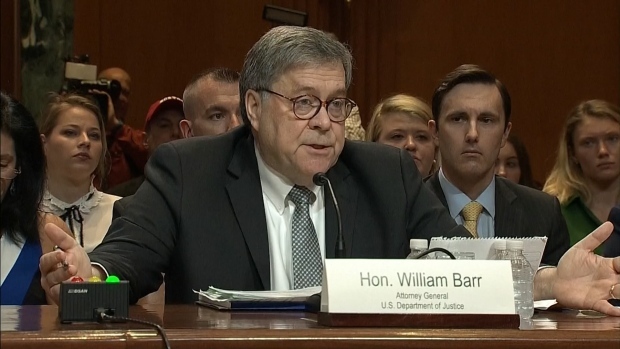 He said the treatment of the Rohingya was "indefensible." On Wednesday, Mahathir toned down his comments, saying that ASEAN leaders try to avoid criticizing each other. He said the issue of Rohingya had come up during a working dinner among the leaders but the main sentiment was a desire to resolve the problem. Suu Kyi became an icon for democracy after spending about 15 years under house arrest for opposing Myanmar's earlier military dictatorship. Though Suu Kyi has been the de facto head of Myanmar's civilian government since her party swept elections in 2015, she is limited in her control of the country by a constitution written under the former military junta. The military is in charge of security operations, including those in Rakhine. Still, Suu Kyi has faced widespread criticism for not speaking out in defense of the Rohingya. Amnesty International became the latest organization to strip her of an award this week, citing the "shameful betrayal of the values she once stood for." Responding to Pence, Suu Kyi said it was good to exchange views, but that "we understand our country better than any other country does. I'm sure you will say the same of yours, that you understand your own country better than anybody else." "So we are in a better position to explain to you what is happening, how we see things panning out," she said. After the meeting, senior U.S. administration officials said Pence and Suu Kyi had discussed the importance of having Rohingya return home, but only on a voluntary basis, with safety and dignity. Pence also urged Suu Kyi to pardon the imprisoned journalists. Myanmar's government and most of the nation's Buddhist majority say Rohingya are "Bengalis" who migrated illegally from Bangladesh, and do not acknowledge the Muslim minority as a local ethnic group even though they have lived in Myanmar for generations. A Bangladesh official said Wednesday that authorities are ready to begin repatriating more than 2,200 Rohingya refugees to Myanmar. Bangladesh repatriation commissioner Abul Kalam said 30 refugee families would be transferred Thursday at the Gundrum border point near Cox's Bazar, where refugees have been living in cramped camps. U.N. officials have urged Bangladesh to move cautiously on the repatriation plans, saying such a move would endanger their lives. The office of U.N. human rights chief Michelle Bachelet said it continues to receive reports of rights violations in Rakhine state, "which include allegations of killings, disappearances and arbitrary arrests." It said some 130,000 people, including many Rohingya, remain internally displaced in central Rakhine. The U.N. refugee agency UNHCR also has advised against the returns, saying safety should be assessed first. But it did not call for a halt to the repatriation plans. Associated Press reporters Annabelle Liang, Sam McNeil and Elaine Kurtenbach contributed to this report.